Water Warts: What is Molluscum Contagiosm and How is it Treated? You are here: Home / Skin Health and Disease / What is Molluscum Contagiosm? With spring and summer approaching there are things to look forward to… and then there are things to look out for. Molluscum Contagiosm is one thing to be on the lookout for with increased pool parties, water slides, and play dates. If you suspect that your child may have Molluscum, do not fret as there are many different ways to treat this benign condition. Molluscum Contagiosm: What Is It? Molluscum contagiosm is a common skin condition caused by a virus (pox virus). 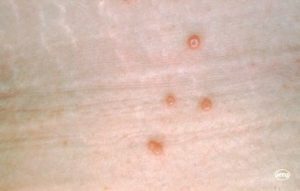 The lesions are usually small flesh-colored or pink dome-shaped growths that can occur anywhere on the body. These “bumps” can look like a smooth wart-like lesion with a pit in the center. The molluscum virus is usually transmitted from skin to skin contact, occurring most often in young children, especially among siblings. It can also be transferred from the sharing of clothes and towels. The virus can spread from one part of the body to another from picking and scratching. Hygienic measures are the best way to prevent the spread of Molluscum on one’s self and to other individuals. You may have heard molluscum referred to as “water warts”. Swimming in a pool itself may not be the cause of the virus spreading, but the activities associated with swimming such as sharing towels, pool toys and other equipment which can transmit the virus. Because molluscum is contagious, siblings who bathe together are at a higher risk of infection. If one child has active molluscum, parents should bathe children separately and use different washcloths, towels, etc. As mentioned, the immune system will eventually recognize the virus and resolve it. Also known as “beetle juice”, is a liquid that is applied on each lesion in the office, and washed off at home 2-4 hours later. Cantharidin causes the treated areas to mildly blister and destroy the virus. physically extracting each lesion (like popping a pimple). However, usually not recommended as it can be painful for the child. Prescription-strength topical creams are also available to treat molluscum at home but may take longer to work than in-office treatments and are typically ineffective. The highest success rate for treating molluscum is multiple in-office treatments of Cantharidin spaced 4-6 weeks apart. Since the incubation period- the time between when the skin is infected and the bumps appear- is six weeks, sometimes after the existing lesions are treated, new bumps may form.